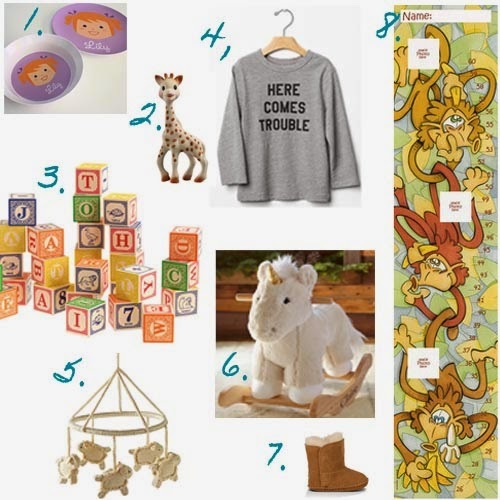 The final gift guide (part 1 for women and part 2 for men can be seen through these links) is for the babies in your life. I am a proud "auntie" of 4 happy babies, now toddlers, and I have enjoyed buying them gifts over the years. With more on the way, here are some gifts for the holidays and beyond. 1. Personalized Plate and Bowl: An fun, customizable set to use every day. 2. Sophie the Giraffe: This teether is so cute! 3. Wooden ABC Blocks: These blocks are a classic gift for babies. 4. Kate Spade and Jack Spade for Gapkids: This designer collaboration has adorable pieces for girls and boys, ages 2-5 years. 5. Crocheted Lamb Mobile: They'll start "counting sheep" early. 6. Unicorn Rocker: An adorable rocker that will add whimsy to any nursery. 7. UGGs: Keep their toes always warm. 8. Growth Chart: To document when they go from little to not-so-little. Happy Thanksgiving Eve and good luck on Black Friday! I love the Kate Spade/Gap collaboration... if only they had baby sizes! (I am tempted to buy and stash some of the toddler outfits for Grace... and the shoes! Gah!). Hope you have a great Thanksgiving! Adorable! I may just have to get those baby Uggs for my niece.